In many family law cases, courts will order the parties to retain the services of a child custody evaluator who is authorized to evaluate issues related to custody and then prepare recommendations for the court. California common law has evolved over the years to afford people who are performing functions that are considered “judicial in nature,” the benefit of something called a quasi-judicial privilege. This means that that person would be entitled to immunity from liability for acts performed within this role. Families facing contentious child custody disputes often need the assistance of an evaluator to help move the process along. But before parents reach that point in the proceedings, it is critical that each party consults an experienced family law attorney who is fully familiar with the law and procedure applicable to a custody case in San Diego. In a recent decision, the California court of appeals addressed the question of whether a family court child custody evaluator is entitled to quasi-judicial privilege if the evaluator did not have the proper jurisdiction at the outset, to issue an order concerning custody. In this case, the spouses were involved in a lengthy, bitter custody proceeding. The mother brought an action against the psychologist and family court child custody evaluator, alleging claims such as negligence, breach of contract and intentional infliction of emotional distress. Specifically, the mother argued that the evaluator issued a custody order that restricted access to her children. The custody evaluator responded by asserting quasi-judicial and litigation privileges as absolute defenses to these claims. At some point during the proceedings, the family court judge alluded to the “court-authorized” power of the evaluator to issue orders modifying the visitation schedule, pending review by the family court. Under this directive, essentially, the parties would be expected to comply with any interim orders handed down by the court evaluator. The mother did not object to this appointment or authority. The trial court ruled that the quasi-judicial immunity applied under these circumstances. The court of appeals affirmed the holding and pointed to an earlier opinion in which a California appeals court noted that the work of an evaluator involves neutrality and impartiality, similar to that of a judge and therefore, he or she should be entitled to the same immunity as others who perform such functions. In this case, the mother conceded that the act of issuing a child custody order is a judicial function. The court held that here, even though the trial court exceeded its power in delegating such judicial authority to the court evaluator, the act itself nonetheless “cloaks” the delegate with immunity. In effect, the court concluded that quasi-judicial privilege applies in the absence of legal jurisdiction. Here, the evaluator’s actions (the subject of this lawsuit) were within his delegated role as family court child evaluator, whether or not that authority was legally appropriate. It is clear from this case that court cases involving child custody disputes are varied and unfortunately, can be bitterly divisive. Parents seeking to achieve the best possible outcome in their custody dispute are encouraged to contact a competent and experienced family law attorney in the San Diego area. 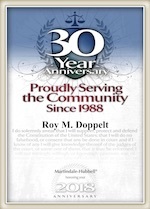 Roy M. Doppelt is an experienced family law attorney and has been representing parents involved in child custody disputes for more than 20 years. Doppelt and Forney, APLC serves clients throughout Southern California, including San Diego, Encinitas, La Jolla, and Chula Vista. For a free consultation, contact Doppelt and Forney, APLC through our website, or give us a call toll-free at (800) ROY IS IT (769-4748).